At just over 2500 square feet, this hillside walkout design offers great curb appeal and a functional floor plan to suit any family's needs. Stone and cedar shake complement the home's rustic styling and an angled courtyard garage adds convenience. The main level features a convenient study/office, unique dining room with tray ceiling, vaulted great room with fireplace and built-ins and a breathtaking octagonal breakfast room that showcases rear views. Both the dining room and kitchen enjoy easy access to the spacious walk-in pantry. The secluded master suite is an enviable retreat, complete with tray ceiling, two walk-in closets, rear porch access and master bath with large shower. 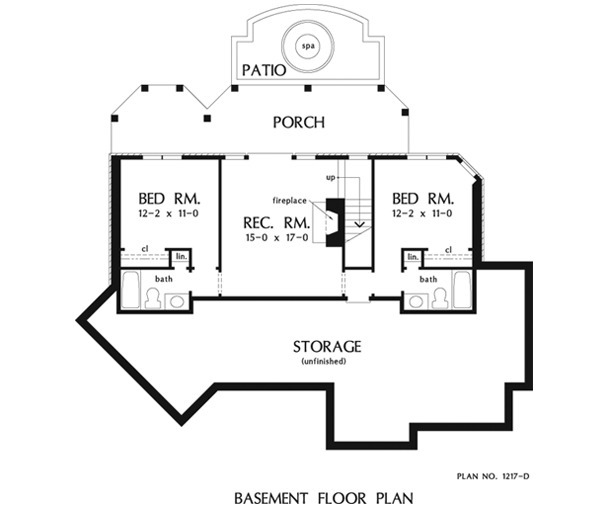 The lower level includes two more bedrooms, two full bathrooms, a recreation room and plenty of storage space. 1st Floor: 1721 Sq. Ft. Unfinished Basement: 657 Sq. 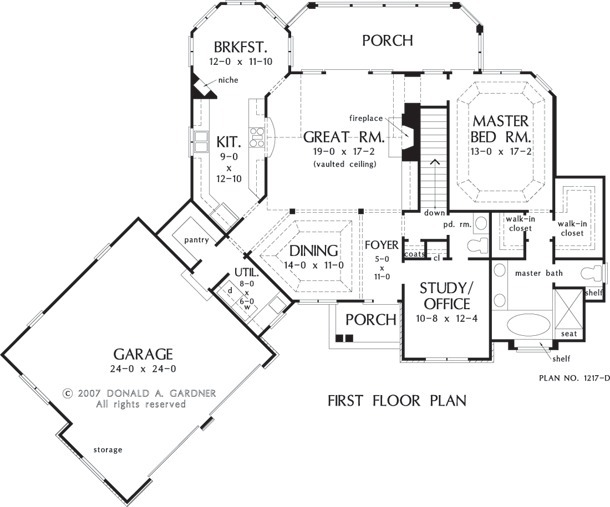 Ft.
House Dimensions: 76' 5" x 63' 8"
Great Room: 19' 0" x 17' 2"
Master Bedroom: 13' 0" x 17' 2"
Basement - Unfinished 1 : 50' 4" x 10' 2" x 9' 7"
Bedroom #2 : 12' 2" x 11' 0" x 9' 7"
Bedroom #3 : 12' 2" x 11' 0" x 9' 7"
Breakfast Room : 12' 0" x 11' 10" x 9' 0"
Deck / Patio : 19' 0" x 10' 0" x 0' 0"
Dining Room (Tray): 14' 0" x 11' 0" x 10' 6"
Foyer : 5' 0" x 11' 0" x 10' 0"
Great Room (Vaulted): 19' 0" x 17' 2" x 18' 1"
Kitchen : 9' 0" x 12' 10" x 9' 0"
Master Bedroom (Tray): 13' 0" x 17' 2" x 10' 6"
Porch - Rear : 36' 11" x 8' 9" x 9' 7"
Porch - Front : 8' 4" x 5' 0" x 10' 0"
Porch - Screen : 24' 3" x 8' 9" x 9' 0"
Rec Room : 15' 0" x 17' 0" x 9' 7"
Study : 10' 8" x 12' 4" x 11' 0"